That, my dear, is the sound of the gravy falling on your pretty little dress *gasp*! Your dress is stained, and it was your favorite one too. What a tragedy it is when clothes are stained. Stains are awful. Absolutely awful! You could be out to dinner and drop a sauce-covered fork on your blouse, playing in the park and get your knees covered in grass stains, or kissing your sweetheart but instead stain his shirt with your lipstick, it matters not. Stains are inevitable. We know you don’t want to use harsh chemicals to remove these stains. But if you’ve heard many old wives’ tales regarding stain removal that just let you down, you are probably skeptical about every homemade stain remover. We understand your skepticism. That’s why we bring you two very easy homemade stain removers for clothes that fight every stain, with pictures showing you their effects. 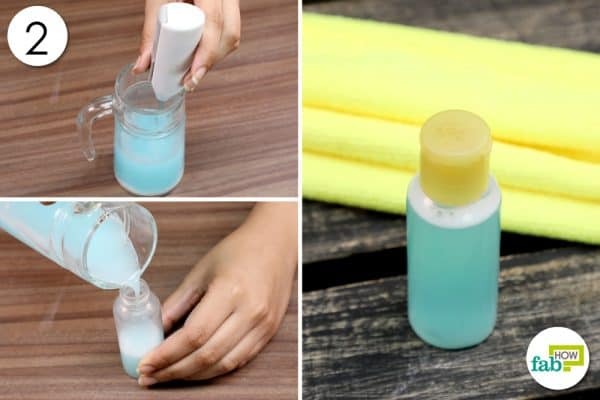 This stain remover is cheap, effective and works wonders. With a need to preserve your clothes and also not spend excess money on things that could easily be made at home with simple ingredients, this DIY homemade stain remover for clothes is a wonderful solution to your stain problems. Ammonia is one of the most common and powerful cleaning agents found in most households. It often plays second fiddle to bleach. It can be used on its own or as an ingredient in other cleaning solutions. You can use it to clean a variety of surfaces like white sinks, tubs, toilets, and tiles. It easily breaks down grime and stains from animal fats or vegetable oils. You can rub out perspiration, blood or urine stains on your clothes with ammonia. It is also effective on most non-oily such as stains like hair-dye on clothes. With ammonia, we used Dawn dish soap in this stain remover. 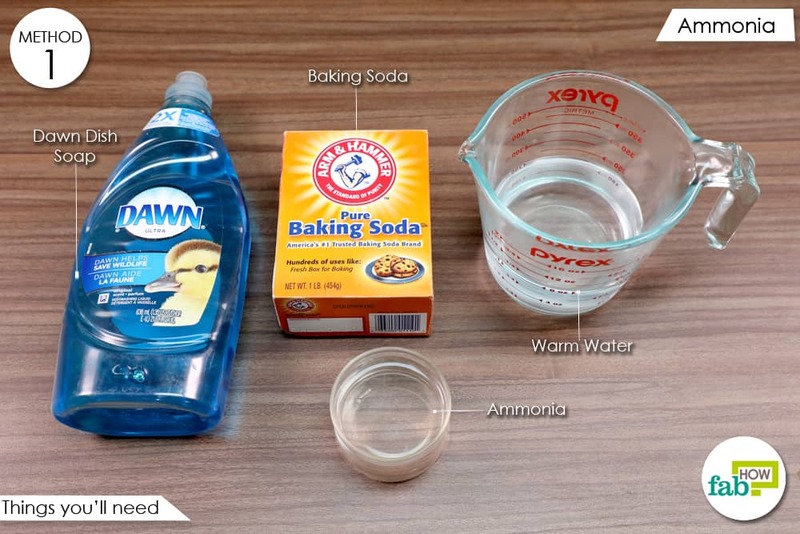 Along with being a grease-cutting agent for washing dishes, Dawn dish soap is an excellent stain removal agent for laundry, carpet and other fabrics. If you don’t have Dawn, you can use any other liquid detergent or dish soap that you have on hand. 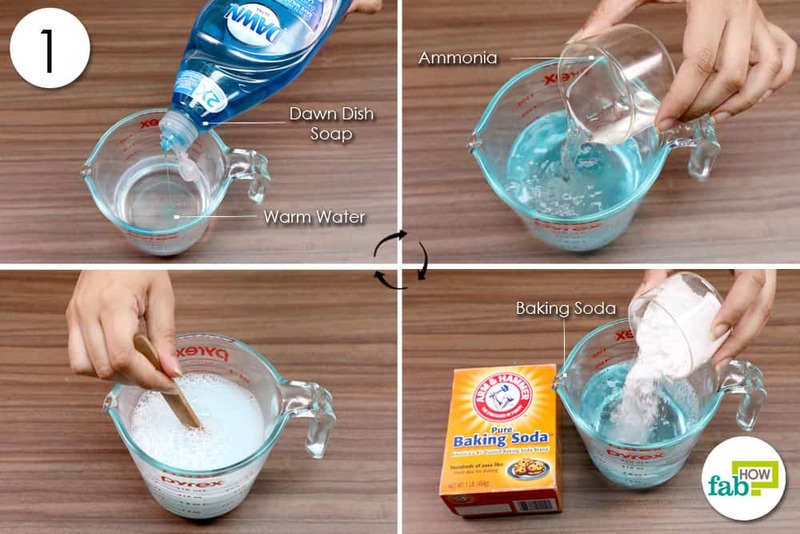 Baking soda is a natural, non-toxic and cheap solution for removing stains. It cuts through grease and oil, and can chemically neutralize odors or absorb the particles causing the odor. Pour ½ cup of warm water into a jar. Add ¼ cup of dish soap to it. Pour in ¼ cup of ammonia. Spritz the homemade stain remover on the stain. This DIY homemade stain remover will stay potent up to 6 months. Note: Always do a patch test on a hidden area of the stained item to be sure the homemade ammonia solution doesn’t damage the fabric. The hydrogen peroxide in your medicine cabinet can be used for a variety of cleaning purposes, such as whitening your whites, brightening your colors, removing stains and odors, and cleaning and disinfecting your washer. You can consider hydrogen peroxide as the friendlier cousin of bleach. It can whiten and clean, but with a milder chemical structure than bleach. The chemical formation of hydrogen peroxide is two atoms of hydrogen and two atoms of oxygen. It breaks down into water (as it’s basically water with extra oxygen). So you can see, it is a kinder alternative for the environment as well. And it’s cheap! 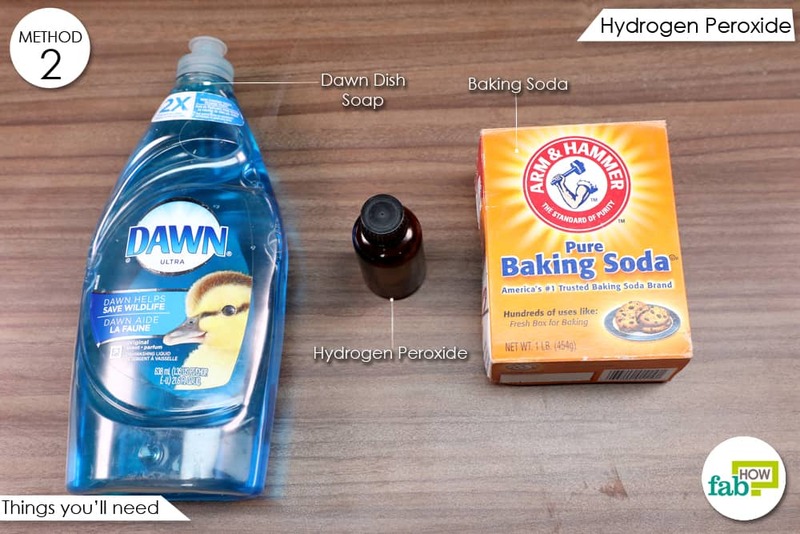 The two simple ingredients – Dawn dish soap and hydrogen peroxide – do a fantastic job of cleaning stains. 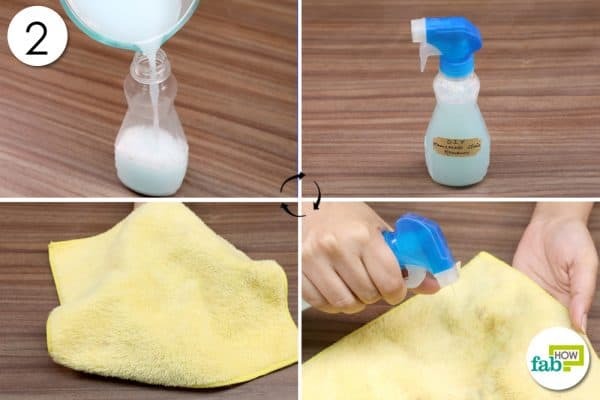 This magic solution can get rid of many stains, including food items like mustard, ketchup, red wine, etc. and even blood. You only have to gently scrub the stain until it is gone, then launder it as usual. 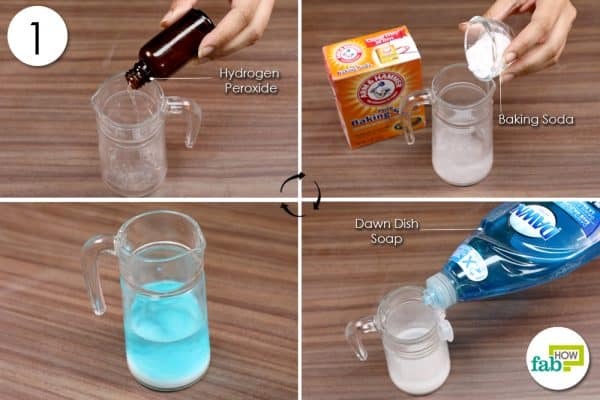 Pour ½ cup of hydrogen peroxide into a jar. Add ¼ cup of dish soap. 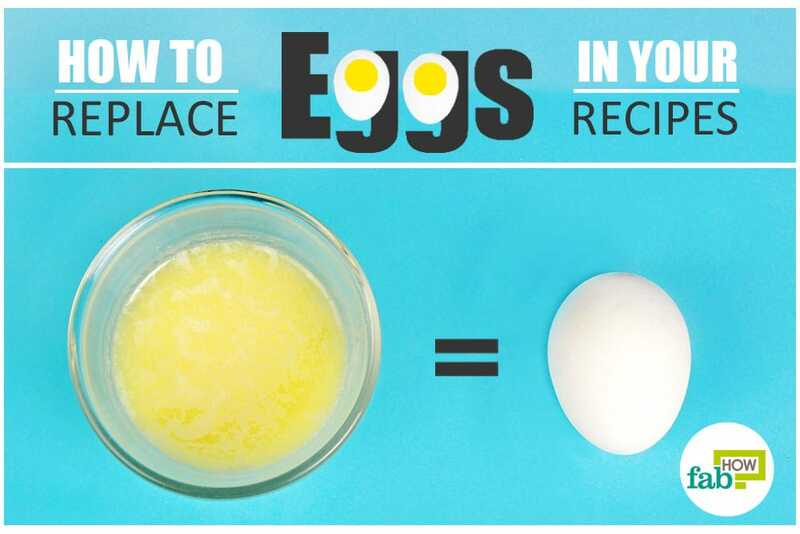 Whisk the solution and transfer it to a small bottle. Apply the stain remover directly on the stain. Gently scrub it with a nail brush. Allow it to sit for between 15 minutes and 1 hour, depending on the stain. Store this homemade stain remover for clothes in a cool, dark place for up to 6 months. Even though hydrogen peroxide is the mild form of bleach, do a patch test before using it on visible areas of clothes or other fabrics. Dip a cotton swab in hydrogen peroxide. Rub it on the fabric in an inconspicuous spot, such as the hem or inside the seam. If the color transfers to the swab, then don’t use this method. Always try to tackle stains as quickly as possible. The longer it sits, the more permanent it becomes. Never forget to read the care label on the garment. It will help you determine which type of stain removal method would be good for the fabric. The fabric of the garment also needs to be considered – whether it is cotton, synthetic, wool or silk – before using any of the stain removal methods. Scrape off as much of the stain as possible before treating it with a stain removal agent. The less sauce you have to deal with, the better. If the stain is from a liquid, blot it with a paper towel. You could also use a spoon to remove the excess liquid or dip the corner of a clean cloth in it to absorb it. If the stain is from something solid, use a dull knife or spoon to scrape off any excess before treating it. If the stain is from a powder, either brush off or shake off as much as you can. Always be careful about not spreading the stain when removing the excess. Handle the fabric gently. Don’t rub, fold, wring or squeeze it while removing the stain. It would cause the stain to penetrate more deeply and also damage the delicate fibers. Don’t use hot water on stains. Don’t dry stained articles with heat and never iron stained fabrics. Heat will make stain removal impossible. Though in some fibers, heat can be used to remove wax. While removing the stain, work from the center of the stain outward to avoid leaving a ring in the area you just cleaned. Always apply stain remover to the underside of the stain. Treat the stain from the opposite side of the fabric and place a clean paper towel underneath it. While some stains are easily removed, some tough stains will take time and patience. If the stain remover does not remove the stain completely the first time, then repeat the process again. For an ink stain on your carpet, try soaking the stain in rubbing alcohol or baby shampoo and then scrubbing the stain as usual. For ink stains on clothing, vinegar and milk are the best home treatments. If you’ve got gum stuck on your T-shirt, simply rub some ice on it or place it in the freezer. You can easily scrape it off once it’s frozen. If your towels smell musty, put them in your washing machine. Add ½ cup of baking soda right over the towels. Use hot water and run a full cycle. Sunshine can do wonders for stained clothes. If none of the above tips were helpful in removing a stain, then set it in sun to dry. However, this is recommended only for light-colored fabrics, as the sun can fade dark colors. Once you have properly treated the stained area and washed the garment, you can set it in the sun.